I got the call last week that my grandmother had had a stroke and was in the ER waiting on a room in the neurology unity. To be honest, my first thought was, “Well, that’s it then, it’s the beginning of the end for sure.” She will be 97 in January—so my less than positive outlook wasn’t without merit. On the other hand, her mother was almost 102 when she died. There is some serious longevity on that side of the family. One could make the argument that I should maybe take better care of my bod because I may be around for a while—like maybe put some lotion on my legs every now and then—like oiling up a good old leather suitcase. Or not. Seems like a lot of work—plus my mom’s side die early so that should offset it. So back to the stroke (you can tell by my cavalier attitude that she survived the stroke—but, let me just say that in case my tone seems less than caring and/or insensitive: she’s fine) …we didn’t know that on the way up there though. She was at UCLA and my uncle who lives in LA and had seen her sooner than we could gave us a pretty grim report: the usual stuff: paralysis, feeding tube, catheter, confusion, fear, in an out of consciousness and all those horrible things that go with things like strokes. So, we crept into room #6653 quietly and slowly and afraid of what we would see behind the curtain. But there she was, sitting up, complaining about the feeding tube, the crappy reception on the TV and trying to get to her purse so she could put some lipstick on—Revlon’s Love That Pink—she’s never worn anything else. So, did she really have a stroke? Oh yeah. Big time. But, some people are just STRONG. I swear to God she’s like Keith Richards only without the heroin and the Jack Daniels. The doctors were literally blown away. Doogie Howser and all his younger pals were there checking all her vitals and reviewing the CT scan images which did in fact show a real clot in her brain that caused the actual stroke. They asked her what day it was and who was the President and she knew all that and also knew the names and phone numbers of her primary care doctor and her cardiologist. She knew everyone’s name in the room—she remembered the nurse’s name from the night before and asked her to go down to the gift shop to buy her a bunch of birthday cards because everyone in my family has birthdays in September and my grandma didn’t want to forget to get the cards and cash in the mail. Honestly, other than the fact that she can’t see, she is a marvel. 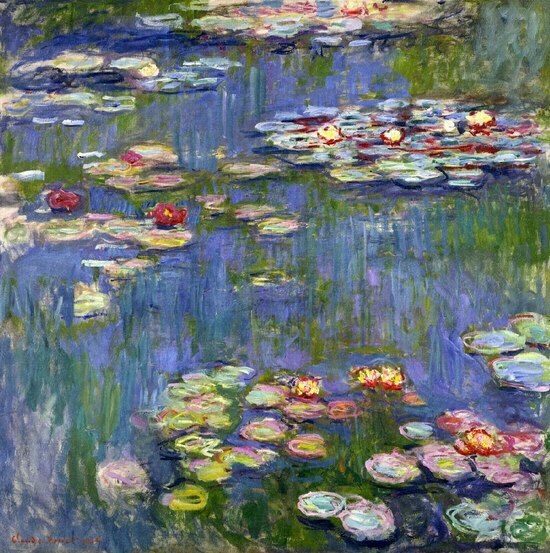 And I don’t mean she’s blind, she’s more like Monet—an artist whose vision is slowly deteriorating. She told me the other day for a few hours she couldn’t see color and they were the most depressing hours of her life. Probably the worst moment of the visit came when one of the nurse’s pulled the feeding tube out from her nose. That’s no fun for anyone—ripping medical tape from her paper-like skin and then pulling a good 13 inches of plastic tubing from each nostril. Good God in Heaven. I was holding her hand at that moment and she squeezed hard…hard enough to hurt…which was a good sign. And she certainly hasn’t lost any of her…um…tenacity? My mother would use different words. When the doctor suggested she use a walker all the time and have someone living at the house 24/7—ideally an American nurse, not a non-English speaking housekeeper—she just shook her head and said that her cane was fine and that she didn’t like people around her all the time “watching her” and “lurking.” Quite frankly, I get it. She’s managed to hang on to the all elusive “quality of life” for 97 years and she’s not willing to budge at this point. More power to her. We should all be so lucky. So I’m 46 and she’s almost 97. She was 50 when I was born. She truly was middle-aged at that point meaning: at the midpoint of life—not many people can claim that or pull that off. And certainly there are plenty of people on this planet that have and have had much harder lives, but it’s all relative I guess. I’m glad I got to know her and that my kids got to know her. She’s a funny broad. She loves Wheel of Fortune and In n’ Out Burgers. She’s a sucker for an underdog, even if it means being an enabler (I hate that word). She used to paint and play golf and garden and drive when she could see. She never forgets a birthday and usually sends down a card of an animal that sings a song or makes some kind of noise. I guess my knee jerk reaction would be to say that at the rate I’m aging right now, I do NOT want to make it to 97, but she makes me feel differently. It’s all about “quality of life”—and that’s a pretty broad term or phrase—could be very different from one person to the next. Maybe it’s more important to think about always improving the quality of life of those around you—that way if you do make it to 97, people will still show up at your hospital bed and hold your hand when they pull the feeding tubes out. Pretty decent advice: try to behave well and treat people kindly enough so no one will be sick of you 50 years from now. Tall order but certainly worth striving for. Take it in increments…50 days, weeks, months…years…just be the best person you can be for the next 50 minutes…and repeat. Teachable MOMent: I hope we all have/had some fabulous broad (defined by strong, vivacious, big heart) in our lives that has mentored us, taught us valuable lessons and keep our priorities in perspective, like staying connected to those you love and taking care of yourself for the sake of those you love. Please click to read more about stroke prevention. Manage personal risk. Fill out the Stroke Risk Scorecard and discuss with a healthcare professional. Click to see O-MAMA’s “Healthy Debate” comic. Click to watch O-MAMA’s “An Apple A Day” video (filmed before passage of ACA).